Simple RSS Reader Application project is a simple and extendable IOS application source code. 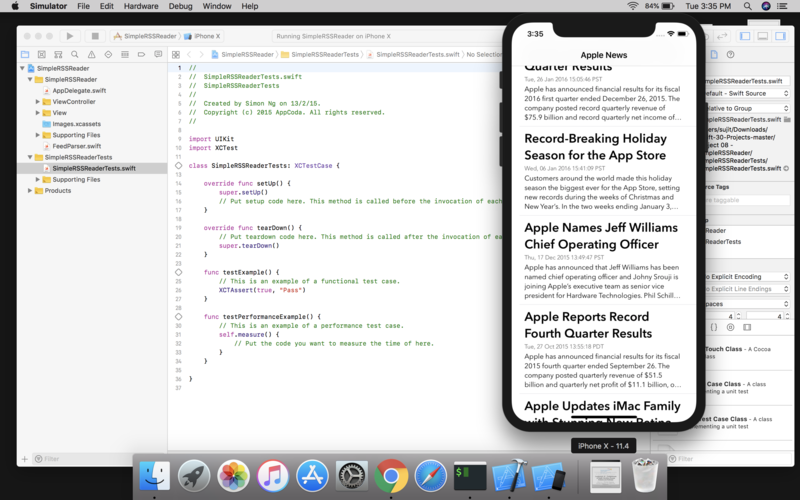 Beautifully, This IOS app connects to your blog site and let you see daily posts. If a user loves to read information from an online blog website like news, sports, etc. he/she can easily customize and use for entire reading experience with this simple RSS reader iOS app. This simple iOS app helps the user to keep updated from various sites. This simple application is an excellent way of starting to learn iOS App. using Swift Language. It is designed to be fast, easy to use, simple, and it does not contain all those complicated menus which might put some users in difficulties. This project includes Swift language. In order to run the project, you must have installed Xcode on your MAC OS. This app demonstrates the basic use and implementation of tab bar controller, navigation controller, scroll view, and storyboard. Simple RSS Reader Application in Swift project with is free to download source code. Use for education purpose only!